In the popular mind, until recently, the steam engine was supposed to have sprung full fledged from the brain of James Watt, as he sat watching his mother’s teakettle. A little careful investigation shows that Watt, while adding some of the features, which make up the modern engine, was only one factor among contemporary causes in the progress of this machine. Since the advent of the steam turbine, it has been repeatedly brought to our attention that the turbine form of engine was the first one to be proposed, and Hero’s device of 200 B. C. has been frequently mentioned and illustrated. His device was at most an interesting scientific toy, but some of the later developments were also along this line. The first one which was even suggested as a useful machine was that of Branca, who in 1629 proposed a horizontal jet wheel driven by steam, the illustration showing an application of this to grinding corn, but there is no evidence that this was put into use. It remained for the Marquis of Worcester at about the same time to first apply the force of steam for actual work. This was done in the pumping of water at Raglan Castle by a device which is to all intents the same in operation as the modern pulsometer, except that it is not automatic. It is interesting to note that, up to this time, no engine using a cylinder and piston had been considered, and the first one proposed was a combustion engine invented by Huygens in 1680, to be used with gunpowder. Improvements on Worcester's device, which was of necessity a high-pressure machine, were made by Savery, who installed a number of plants for pumping water from mines in the Cornwall district. He proposed the use of this engine for driving mills, the method being to raise water with it and then use the water in a wheel, but this was never put into practice. The addition of the safety valve to the steam system by Papin was followed by the production of the first steam engine with a piston, but his method of applying this for power was the same as Savery's, viz., through a water wheel. Thomas Newcomen, in England, was the first engineer to propose the application of a piston to a train of mechanism, separating the steam cylinder from the pump cylinder. In his apparatus the piston was raised by the force of steam and then condensation of this steam by a jet of water pulled up the pump rod and bucket, so that the engine was working on the low-pressure condensing system. This arrangement was applied about 1710 through the mining district of England, one of the engines having a pump 8 inches in diameter lifting 172 feet and a steam piston 2 feet in diameter with a 5-foot stroke, giving about 8 horsepower. The addition of an automatic valve gear by an ingenious youngster named Potter who wanted to play marbles instead of tending engine, and its improvement by Henry Beighton in 1718 made the engine self-acting, and in this form it was found by John Smeaton, who was the first engineer to really design an engine with a consideration for the proper proportion of its parts. Smeaton's accomplishments were by no means confined to the steam engine field, as he was a builder of lighthouses, hydraulic works and other notable engineering undertakings. His first engine was erected in 1774, and from that time on a large number of installations were put into service. One of Newcomen's engines which Smeaton tested had a cylinder 10 inches in diameter by 3 feet stroke and gave a duty of 2,919,017 foot pounds for 84 pounds of coal. One of Smeaton's own engines had a cylinder 52 inches in diameter by 7 feet stroke, giving 40 effective horsepower and a duty of 9,500,000 foot pounds for 84 pounds of coal. The boiler evaporated 7.88 pounds of water per pound of fuel, which was not a bad record even for present practice. The use of the steam engine at this time is indicated by the fact that Smeaton found when he commenced his work fifty-seven engines at work in Newcastle running from 28 to 75 inches in cylinder diameter. Within 13 years he had put into services eighteen more large engines and continued installing up to the time of his death, carrying his work into Russia, Holland and Scotland, the application in the last named country being for the working of blowing machinery which was the first mechanical work attempted aside from the raising of water. It was in this form as a practical and well proportioned machine that James Watt found the steam engine. His work consisted in remedying many of the losses in the engine, perfecting its mechanism and applying it to all kinds of industrial uses. A model of the Newcomen engine came into his hands, and by means of experiments on this and careful scientific study he found that three-fourths of the steam was wasted and that altogether too much condensing water was used. Up to this time, condensing of the steam had always taken place in the cylinder itself, and Watt reasoned that this was one cause of the loss and used the separate condenser with marked improvement in the power of the engine and decrease in the steam consumption. The engine was now changed from an atmospheric pressure to a steam pressure machine and the development from this time was largely one of mechanical improvement. Speaking of one of his early engines, Watt says that it had a cylinder 5 or 6 inches in diameter and 2 feet stroke, of copper smooth hammered but not bored, encased in a cylinder of wood. This engine was used non-condensing, depending entirely on the steam pressure for power. 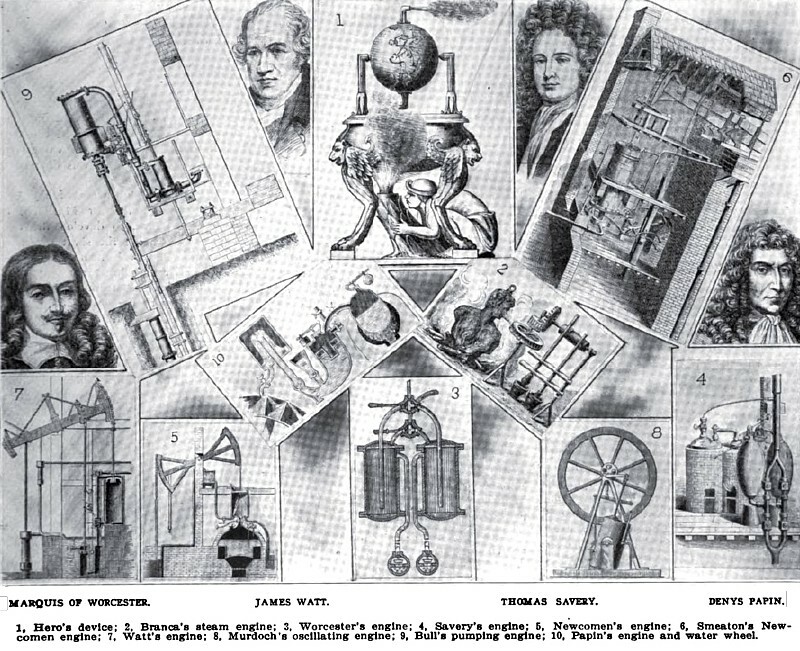 Watt's first applications were pumping engines and later by the use of the sun and planet wheel the driving of a shaft was accomplished. For the privilege of using the crank, Watt and Matthew Boulton, who was his business partner, were obliged to pay royalty to Matthew Wasborough. 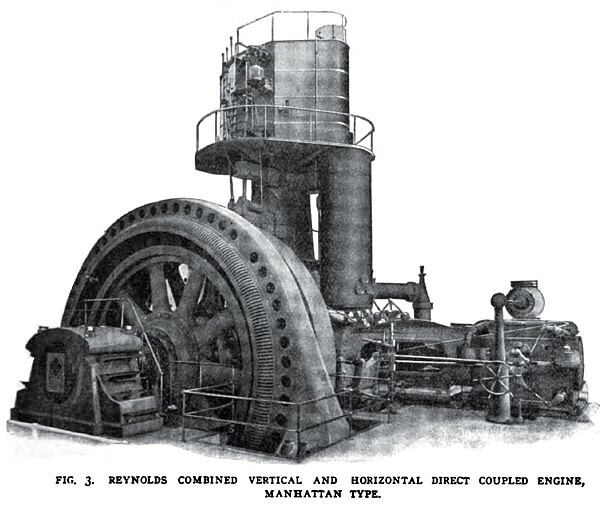 Watt's next improvements were the double-acting engine, the twin engine and a patent for a rotary engine or steam wheel, the latter never being utilized. In rating his engine he specified cutoff at one quarter stroke to get expansive working for those engines which drove a shaft provided with a wheel. Watt and Hornblower both claimed the honor of the compound engine, but this form was never built to any great extent by Boulton and Watt. Mechanical details added were the cross-head and guide, the fly-ball governor with throttle valve in the steam pipe, the mercury steam gage and glass water gage for the boiler, the trunk engine, the positively driven valve gear, and to perfect the engine was devised the indicator. All Watt's engines were of the beam type and it remained for Murdoch, one of Watt's foremen, to develop the oscillating engine driving the shaft direct and using the D slide valve, and for William Bull to devise the direct acting pumping engine in which the steam piston was attached directly to the pump rod. From this time on the development of the engine was one largely of application rather than changes in form, down to well into the present century, Watt's work having stopped in 1819. From the time of Murdoch and Bull, who worked at the same time as Watt, until Corliss appeared, improvements were largely matters of refinement in construction and changing details of arrangement. The drop cutoff principle was developed about 1841 by Sickels, for use on marine engines; it was adopted for stationary engines by Thurston, Green Co., of Providence, R. I., and Corliss' invention consisted in the rotary valve and the attachment of the governor to the cutoff mechanism so as to determine the time of releasing the valves. This was accomplished in 1849 and from that time until the present the Corliss engine has been looked upon as the highest form of reciprocating engine construction. 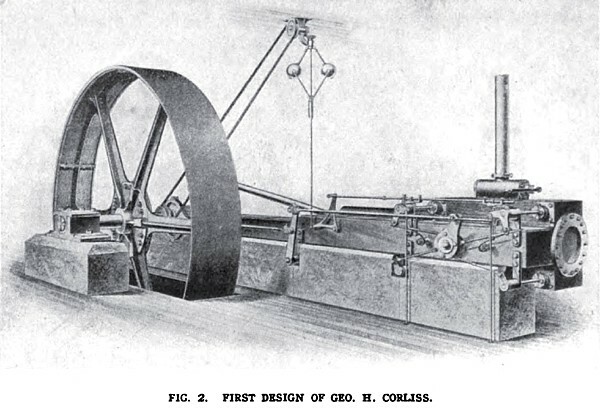 When Corliss entered the field, steam pressure stood at 70 pounds and piston speed at 400 feet a minute and an engine of 500 horsepower was tremendous. At the time of expiration of his patent in 1870, four hundred and fifty engines were in actual operation under Mr. Corliss' patent. In the development of the Corliss design, Edwin Reynolds has been one of the most prominent engineers. Starting in the old Corliss works, Mr. Reynolds perfected a new form of hook releasing gear which has now become the standard with a great number of Corliss engine builders and he changed the form of frame from the girder type used by Corliss to the heavy duty type now common. To his genius is due also the combined horizontal-vertical form which is conceded to be the most compact construction of reciprocating engine where large power must be put into small space. In the high-speed field the developments have been the introduction of the centrifugal and inertia forms of governor, former having been applied to a number of engines, of which the Buckeye was one of the earliest, and the latter having been developed largely by F. M. Rites, although his design has been modified by various other designers for particular cases. Governing by automatic cutoff was, however, used for the slide valve form of engine in 1834 by Zacharia Allen, who used a cutoff valve independent of the steam valve and this device was further improved by the use of four valves, one at each end for steam and one at each end for exhaust, and the weighted governor applied in the Porter-Allen engine by Messrs. Charles T. Porter and John F. Allen, about 1870. An important improvement in the high-speed engine field was the development by John E. Sweet of the flat double ported balanced valve running between the valve seat and a pressure plate as now used in a large number of high-speed engines. Prof. Sweet also developed a special type of governor in which the weight is mounted directly on a leaf spring and in one form of engine this has the eccentric connected to the valve through a rocker arm in which the two ends are set at such an angle as to correct for the angular effect of the connecting rod and equalize both lead and cutoff at the two ends of the cylinder. The latest comer in the steam engine field is the turbine, early practical development of which is due to the efforts of De Laval in Sweden for the single wheel, Parsons in England for the reaction type, and Curtis in this country for the multistage type. Other inventors have, of course, been working simultaneously and the matter of priority of ideas is difficult to establish. The modern period of development of the turbine dates from about 1825, but the actual application in commercial development dates from about 1880, at which time both De Laval and Parsons came into the field. Development in France has been largely the work of Prof. Rateau, whose patents date from 1894, in Germany by Prof. Riedler and Prof. Stumpf, and in Switzerland by M. Zoelly. What is known as the Pelton type has been developed by Riedler and Stumpf abroad and by John Richards and C. V. Kerr in the United States, while a special form of reaction has been perfected by E. M. Terry and independently by W. E. Snow.